I must say that I had an "Ah Ha" moment yesterday after reading blogger buddy Jessica's post "Embrace the Sweat" She talks about letting by letting "cluttered, stressed thoughts override the power of a good sweatfest." I realized that I have not been fully enjoying my workouts as "me" time. I spend them thinking through all of the many things I need to be doing, should be doing, can't get done. Rather than focusing on the workout, on the time I have set aside just for that, I am already 12 steps ahead onto something else. This morning (as I has promised myself yesterday) I got up early again to get my workouts done and over with. I made it a point to enjoy the moment. To just have fun with the step workout (Shock Cardio Athletic Step) and concentrate on my weights whole-heartedly. It made for a much more enjoyable workout this morning. I wasn't focused on time (either how early it was or how quickly I needed to finish up). I focused on my muscles during weights and worked hard. Not only did I have a good "me" time workout, I also freed up time in the afternoon for myself. I have been feeling so rushed lately, absolutely no down time other than the 30-45 minutes I set aside to read before sleep. I've completely pushed myself to the limits. So today was sort of a fresh start (I hope). Thank you Jessica for your reminder!!! Now, I won't be delusional nor will I lie and say that I plan to move all workouts to the morning. I know myself. I am really a night owl. I get my second wind mid-afternoon. I have read that in order to stick to workouts, it's best to find the time that works for you. So if you're a morning person, get it done early. Night owls, evenings. But, I will try to get more morning workouts done to allow myself some much-needed afternoon down time. Since I had made soup two days in a row, I figured I should make something else for dinner tonight. I had some leftover filling from the Sweet Potato, Black Bean & Kale Burritos that I stored in the freezer. I also had some leftover quinoa from the Quinoa Cornbread and "cheese" sauce for the Vegan Vegetable "Cheeze" Casserole I made previously. So I decided to do some stuffed poblano peppers. Preheat oven to 375 degrees. Spray small casserole dish with non-stick spray. Prepare poblano by cutting off the stem. Reserve the top portion (not the stem) and mince to put in with quinoa. Make one slit down the length of pepper and remove seeds and veins. Place in casserole dish and cover. Back for approximately 15 minutes until just getting soft, but still firm. 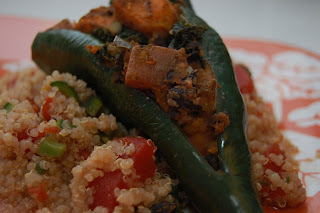 Remove poblanos from dish and pour in the quinoa, tomatoes, minced jalapeno, minced poblano, and spices. Stir together. 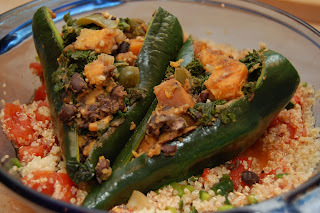 Fill poblanos with sweet potato mixture and place on top of the quinoa. Optional: top with cheese. Cover and bake approximately 20-30 minutes until poblano is cooked. 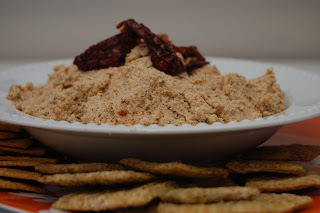 I also made a Sun Dried Tomato Nut Cheeze courtesy of Alicia @ Vegan Epicurean. Cover the nuts and seeds with water and allow them to soak for 4 hours or overnight. Drain the nuts and seeds well and place them in your food processor. Add the lemon zest, lemon juice, garlic, miso, nutritional yeast, oregano and process. Drizzle water into the processor until you like the texture of the cheeze. You will probably need to stop the processor and scrape the sides once or twice. Remove the cheeze from the processor and stir the sun-dried tomatoes into the mixture. Taste and adjust the salt and pepper as necessary. Refrigerate until needed. Use as you would flavored ricotta or cream cheese. This was a super fast, super easy recipe. It would be fabulous on whole-grain crackers, as a spread for a wrap or sandwich, filling for ravioli, or even on a pizza. I have the same problem of clearing my mind. Being present in the moment is great no matter what you are doing. Your dinner sounds great. Definitely my type of food. Glad you liked the latest "cheeze" recipe. My hubby really enjoyed it too. Hi Alicia the "cheeze" was so good. So many different ways to use that one. You're right about being in the moment period, not just with working out. And you are so creative with leftovers! 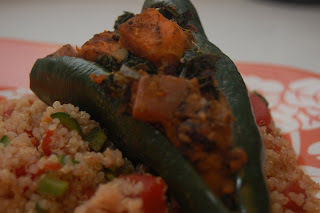 That stuffed poblano and quinoa looks fantastic! Love your dinner pictures! What a creative and unique idea. Anything that involves quinoa is already a winner in my book. I wish I was a night owl but I am up at the crack of dawn without fail! I often have the same problem when I'm working out, and sometimes I'll even try to distract myself by reading a magazine or book... thinking that it will help make time go by faster. However, I think I lose a lot when I exercise this way and could achieve better results just by being present and focusing more. Hi Sophia ! I will agree that after I do get the workout done, I feel great. I love stuffed poblanos, the options are endless! Jessica @ eatdrinkbreathesweat so far your advice has worked for 2 mornings in a row. How are you doing with your over-training??? Ameena funny that you wish you were a night owl and I wish I were an early bird! LOL. Quinoa is great isn't it! Suzie I too read magazines on the elliptical (not on treadmill) in hopes that it'll help pass the time, then I realize I'm slowing down and not really working hard like I should be. That's the one good thing about group classes at least. I think they keep you more focused. With my DVDs, I know them so well, it's easy to lose focus.